When decorating your ideal home, you may find yourself leaving the bedroom until last because you’re eager to impress visitors with your lounge, kitchen and garden. Once you do get around to the job, you may end up swayed by trendy aesthetic ideas – or even, if you’re tired of DIY by that point, doing the job with little forethought at all. But beyond basically looking nice, the way that you decorate and maintain your bedroom is a matter of science: your stress levels, when you check in at the end of the day, can be directly effected by the way your bedroom looks and feels. The centrepiece, of course, is the bed itself, and there’s nothing so relaxing as stretching out on an emperor-size bed – if there’s room for it. If not, at least be sure to use a mattress that will give you the support you need, and go for Egyptian cotton sheets for their softness as well as their breathability. The atmosphere of the room can be improved and regulated with a careful sense of light and air. Try hanging a mirror opposite the window to brighten the room and make it feel more spacious, and use plants or flowers to purify the air and make the space feel natural. When you’re trying to get off to sleep, you’ll thank yourself for fixing the lighting with some forethought. Use warm lightbulbs to create a relaxing atmosphere, and a good bedside lamp to creating a cosy reading space for when you’re winding down. With a thick rug on the floor to add cosiness and absorb the sound of your S.O. tip-toeing to the bathroom in the small hours, you’ll be well on your way to a stress-free bedroom and a good night’s sleep. 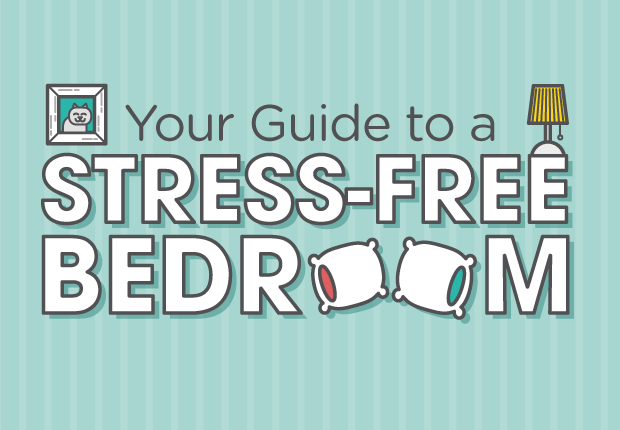 For more essential tips, check out this new infographic and tool up on everything from the most relaxing shade for your walls to how to keep your boudoir as stress-free as the day you decorated. These tips are so handy. I like to have a huge king size bed so there isn’t much room for much else in my bedroom but I still like to keep it looking nice. Hidden storage would be perfect for me I think. What a great tip! Thanks so much for sharing such a useful graphic!